Summer demands fuss free makeup. A naturally pretty look that would not streak when you sweat. Something that is low maintainence and which looks great on the beach. Start by taking care of your skin now. Your body is made up of what you eat and drink. Eat junk food and drink lots of sweet carbonated water and caffeine, and that's what your body has to work with. Your skin reflects the state of your health. If your body is full of junk, your skin is likely to be spotty, congested or at least, far from its best. You might get away with it while you are young, but sooner or later, your excesses would catch up with you. Skip the cola. Drink lots of plain water, spring water or mineral water instead. Get a two liter bottle of mineral water, or fill a 2 liter bottle with drinking water and make it a point to finish that by the end of the day. If you can't tolerate plain water, squeeze a lemon and add that lemon juice to your water to flavor it. This would give your body a chance to clean out the junk. Next, cut down on that junk food.Oily fries with an oily burger is going to load your body with more grease. If your skin is spotty, it might help if you cut down on the grease and sugar. By the way, bacteria loves sugar and you can thank bacteria for those infected spots on your face. Stop feeding the bacteria, keep your hands and hair off your face and let your skin recover. Great summer makeup is best achieved with good skin, so the sooner you start, the better for you. Now for the actual makeup. If you take care of your skin, putting on that natural beach makeup would be very simple. Depending on the state of your skin, you may or may not need concealer. If your skin is great, just use a tinted moisturizer like Burt's Bees moisturizer to add color to your face. Pick a shade as close to your natural coloring as possible. 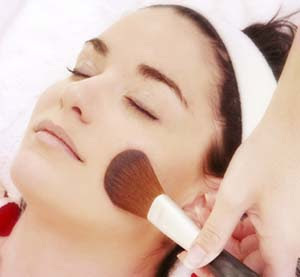 If you have zits, then use a brush and dab on a little concealer over it. If you have dark rings, hide them with a concealer as well. Use as little as possible to keep your look natural. Make your lips thoroughly kissable. Soft, rosy lips that glisten in the sun are perfect for summer... and all year round. You'll need a touch of [http://www.cheapestsale.com/health/lipstick.html]lipstick to add color to your bare face. Go for a pretty color like coral, rose, or a soft pink. The trick is to look in the mirror and see the color inside your lip. Pick your lipstick in a color similar to that for the most natural, prettiest look. Take a lip brush and paint on the lipstick. Start by drawing the outline of your lips with the lip brush, then fill then in. Blot the lipstick with a tissue paper, then apply again. This would help the color stay on longer. Slick on a lip gloss for shine over the entire lips, or at least over the center of your bottom lip to make your lips look fuller. Bring the focus to your eyes. Your eyes are your best asset. Especially when framed by lush eyelashes. Since it is summer, go for a waterproof mascara. Make sure you get a good eye makeup remover to remove it each night before you sleep. Get ready a clean mascara wand to separate your lashes. You can wash and dry the wand of an old mascara, or you could buy an eyelash comb. Apply mascara over your upper lashes. Then touch a little mascara on your lower lashes with the tip of your mascara wand. Separate the lashes with a clean mascara brush or wand and let the mascara dry. Once the mascara is completely dry, you may apply a second coat if you want more dramatic lashes. Separate the lashes after this second coat as well.